Mobility Scooters may be a better choice than a Powerchair for someone who doesn’t need an aid all of the time. If, for example, you need some assistance to get to and around the local shops, but are able to walk around the shops then a Mobility Scooter would be a better solution. 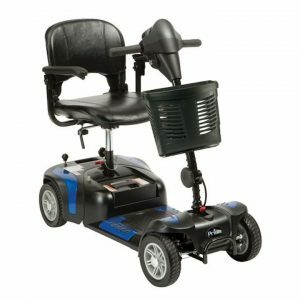 However, you need to have good upper body strength and reasonable balance to manage a Mobility Scooter, otherwise a Powerchair may be more suitable option. You will need to have somewhere waterproof to store your Mobility Scooter and it will need to be near to a power source for charging the battery. Three wheels or four wheels? There are a vast range of Mobility scooters with various features for use both inside and out and the technology is improving and changing regularly. Three wheeled mobility scooters have a better turning circle, but some four wheeled models have been introduced into the U.K. market with a reduced turning circle. Four wheeled Mobility Scooters are more stable and there is a vast range available. From smaller boot scooters, remote controlled folding scooters to larger 8mph and even all terrain type mobility scooters the choice on what mobility scooter to purchase can be daunting. Here at H&M Health & Mobility, we will give you impartial advice on the various mobility scooters available. Choosing the right Mobility Scooter for you. Class 3 Mobility Scooters can travel up to 8 mph and are allowed on to roads. This means they tend to be larger than Class 2 scooters. The user doesn’t need a licence to drive one on the road but, all the same, they must respect the highway code. Class 3 Mobility Scooters need to be fitted with lights, indicators, a horn, rear view mirror and rear reflectors.